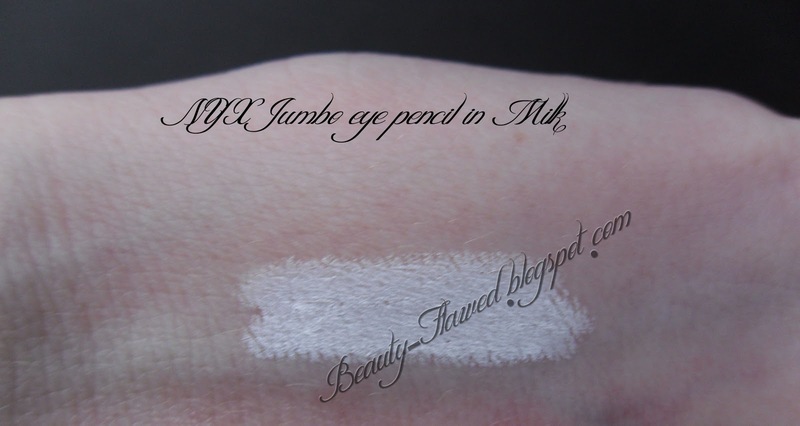 In a bunch of my swatch posts lately I've been using NYX Jumbo Eye Pencil in Milk under the shadows but I haven't actually done a review of it for you guys. So here it is this is a great and inexpensive base to use under your shadows to help bring out the pigmentation of any shade. What I like to do is apply my Urban Decay Primer Potion and then apply this over top. I then blend it out a bit depending on how vibrant I'm looking to go. If you really want your shadow to pop only blend it out a little bit so that the white base is solid but not thick on the lid. If your like me and you just want your shadows to show up better and last longer blend until its a bit more translucent. Ive been using this product under my shadows for a few months now and I really like how it helps make my shadows pop and help them last all thru the day. I have heard some ladies have problems with this product creasing up on them but I personally have not had this issue. I always prime before applying this so maybe that's the trick or it could also be that my eyelids are not oily at all. Its also really nice because it goes on smooth and does not have any scent to it. It is a bit sticky on the lid but if your using it as a base that's what your going to want. To make it less sticky if your just using it as a normal shadow blending it out and setting it with a similar shadow color will help. Since its in pencil form you don't have to bother dirtying another shadow brush for it either just rub on and blend out with your clean fingers. These are available at stores like Ulta or you can find this online they run about $3.50-$5.00 depending on where you get it from. If your looking for a cheap but good base for your eyeshadow I suggest trying this out. P.s. When I first bought mine I had heard that you need a special sharpener for it so I bought the NYX Sharpener to go with it. Now that I have it I can say that it is easier to sharpen it in the NYX Sharpener but it is not impossible to sharpen it in a off brand one. The NYX one is really just slightly larger than my off brand one but it fits the pencil perfect. Now to sharpen it in an off brand one all you need to do is be patient and work at getting the first couple layers off the pencil so it will fit nicely into it. 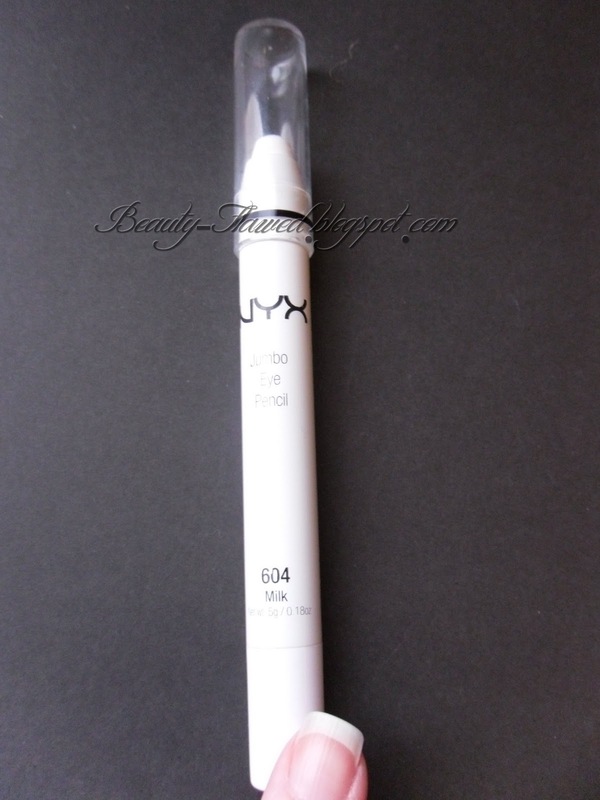 If you can get a hold of a NYX one it will make it easier and its fairly inexpensive around $5 dollars I picked this one up from Cherry Culture. My off brand one I think I picked up at Walmart or Target. Also this NYX sharpener works wonder on Nars Lip Pencils! This is a must have product for me. I love the nyx jumbo pencils. I love to use them with eyeshadow that aren't very pigmented and they make the shadows pop so well. I don't mind sticky. As long as it glides on easily. The white looks nice. I need a white liner. The priming before applying the pencil tip is great! I've seen many videos where they just use it on its own but I guess you don't really see the makeup past the tutorial! @Laura When I was looking into getting one of these I totally thought that you could twist the bottom to adjust the product... Thanks to my blogger friends for telling me otherwise. When I purchased it I also picked up the NYX sharpener to go with it and it works wonders. I updated the post to include how I sharpen mine. 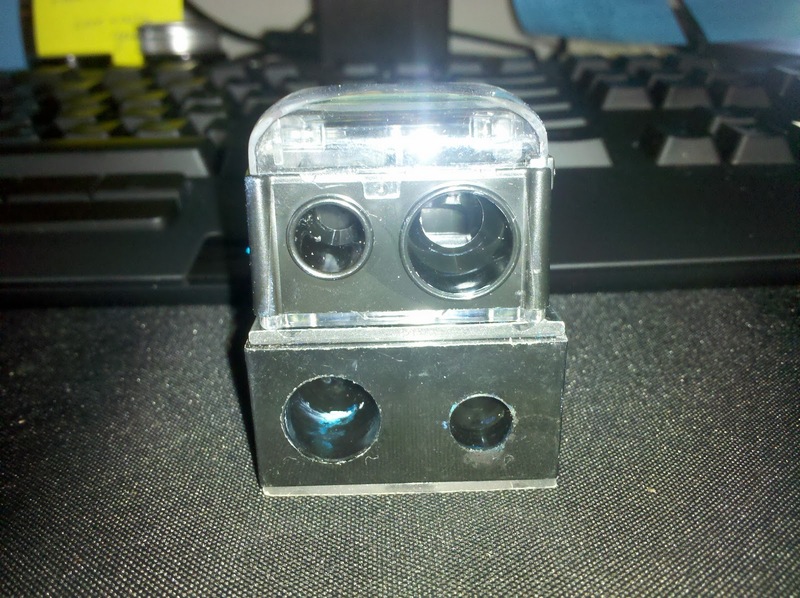 I have used an off brand sharpener on it and it worked but it took awhile to get it to the right size.